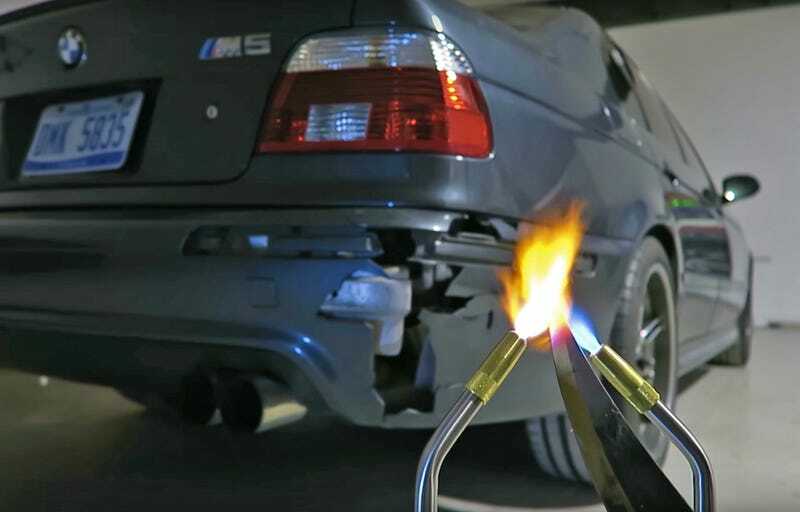 Why Is This Dingus Stabbing His BMW M5? Have you noticed that “poking things with a hot knife,” is a trendy thing to put on YouTube right now? I don’t get it either. Actually, I find it offensive to knives. And heat. Especially when they’re used to violate this most sacred car—an E39 BMW M5. I but just... why. Why do this? I know: “For the clicks.” And I’ve fallen right into the honey pot of a tantalizingly disturbing video thumbnail. Hopefully this dude held his breath while he melted paint and plastic into noxious gas. And, at least there wasn’t any gasoline vapor lurking behind this bumper... I’m pretty sure my old Scout would immolate if I so much as flicked a match in its general proximity. Please stop with the fire poking.